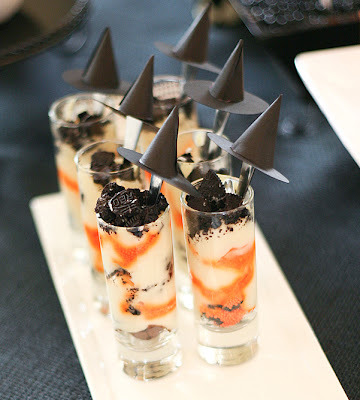 These recipe for these Halloween parfaits sounds delicious. But no matter what you put in your tall shot glasses, the witch hat on top of the spoon is too cute to pass up. If you need a template for the cute witch hats, there is a free witch hat template over at About.com and you can get the Halloween parfait recipe over at Frog Prince Paperie. If you are looking for another fun Halloween dessert idea, check out the Halloween Oreo cheesecakes. They would be cute with a witch hat on them too.